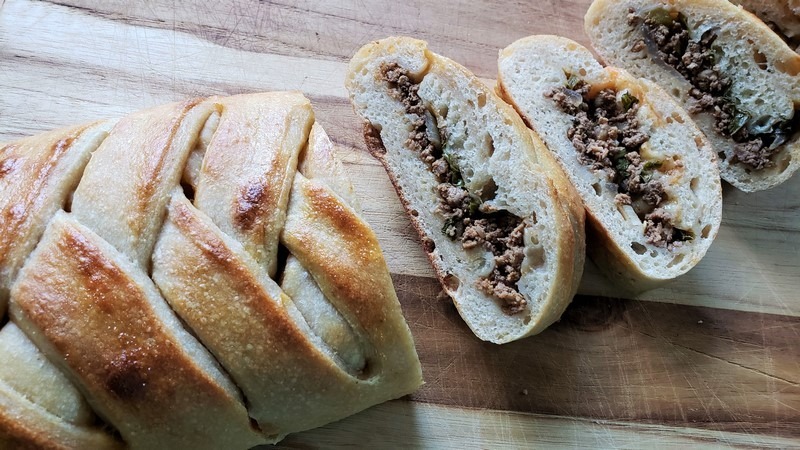 Sourdough Stromboli is an entire meal in a gorgeously woven bread. Choose from a variety of vegetarian or meat-focused fillings, and bake up two strombolis in just 18 minutes. Made this the other day (half recipe) with the spinach filling - very delicious and easy. Thanks so much for the great instructions and photos!! I made this yesterday, it was delicious, the steps are very well photographed too. I made this Stromboli using a cinnamon roll style. Wow cool! What kind of filling did you roll in there? I spread roasted garlic on the dough, then a layer of store bought olive tapenade, followed by shredded Parmesan cheese and a little EVOO. Would this work using only white bread flour? (Substituting bread flour for the quantity of whole wheat flour). You might start with 375g of water and work your way up if needed, since bread flour absorbs less water than whole grain flour. You want the dough to be dry enough you can knead it by hand and wet enough that it’s supple.